The excitement of not traveling on asphalt exclusively in the hot-new Toyota Tacoma is just the start. From mud-laden trails to important ventures on your to-do list, it definitely deals with whatever you have coming up and accommodates up to five individuals. You won't sit on the fence about paying a visit to Westbury Toyota to purchase or lease the model that interests you the most as soon as you learn all about everything the Tacoma can give pickup drivers. This popular truck that bears dirt and mud as a mark of pride makes a fantastic impression from all sides. The dominating grille, large fenders, and carved lines highlight the sturdy, brawny-looking exterior. The ending touch is Tacoma's easily recognizable logo stamped on the conveniently opened tailgate you can lock to secure your cargo. 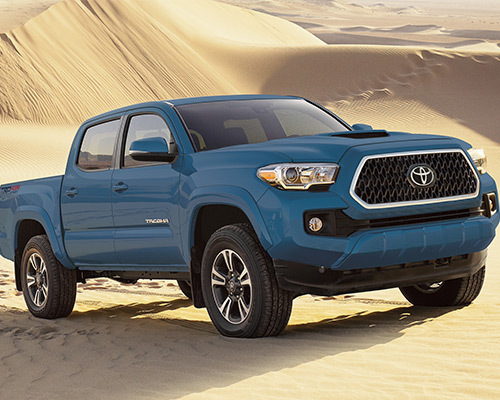 Create 159 horsepower (hp) and 180 pound-foot (lb.-ft.) of torque in the Westbury area with a 2.7-liter (L) 16-valve four-cylinder motor found within the Tacoma waiting for you to purchase or lease at Westbury Toyota. Kickstarted by the 3.5-L Atkinson-cycle V6 motor with direct injection, you can raise your range of power to an extraordinary 278 hp and 265 lb.-ft of torque. Your choice of a six-speed manual or automatic transmission feeds into the power of the motor, as well. Towing heavier toys is no hindrance to organizing for your 4x4 escapades. The V6 includes a Tow Package for total pulling potential of 6,800 pounds (lbs.) and payload levels as high as 1,440 lbs. You won't need to feel anxious about maintaining control should winds start blowing or load swaying occurs with instant Trailer-Sway Control. Enhance your off-road capability in the luxury fabric, four-way variable driver’s seat of Tacoma SR5, which utilizes Rear-Wheel Drive (RWD) with Automatic Limited-Slip Differential (Auto LSD) and Hill Start Assist Control. This truck also makes hitting the highway more enjoyable via standard amenities, such as remote keyless entry, an automatic sliding back window, and 6.1-inch (in.) high-resolution display. After experiencing the 278-hp 3.5-L V6 DOHC motor, six-speed manual transmission, and TRD sport-tuned suspension of Tacoma TRD Sport, you will want to feel the rush for years to come. The outside appears ready to tackle harsh landscapes thanks to a hood scoop, 17-in. machined alloy rims, a color-keyed tailgate spoiler, and smoked taillights for an extra dose of striking design. For the ideal combination of gleaming touches and premium inclusions, Tacoma Limited presents a satin chrome grille, chrome-accented power exterior mirrors and door handles, leather-trimmed benches, and power-tilt/slide moonroof. Further interior features you will relish having access to consist of dual-zone automated climate control, Qi-enabled wireless smartphone charging, Integrated Navigation, and Entune App Suite. Capturing the rush of adrenaline you desire calls for the ideal type of pickup in Westbury NY. Tacoma’s bed surface is formulated from Sheet-Molded Composite (SMC) strengthened with fiber for extreme strength when facing the thumps, scrapes, and dings of your thrilling ventures. Employ the industrial-grade deck rail setup featuring C-channel frames and four versatile tie-down cleats to safeguard equipment of all shapes. Even the most problematic of settings is a breeze for the updated Toyota Tacoma with the introduction of an electronically locking rear differential, Crawl Control (CRAWL), and Multi-Terrain Select. These optional specialized add-ons enable you to uphold ideal traction on a variety of terrains through even allocation of power to the rear wheels, throttle and brake regulation, and five modes to switch between. 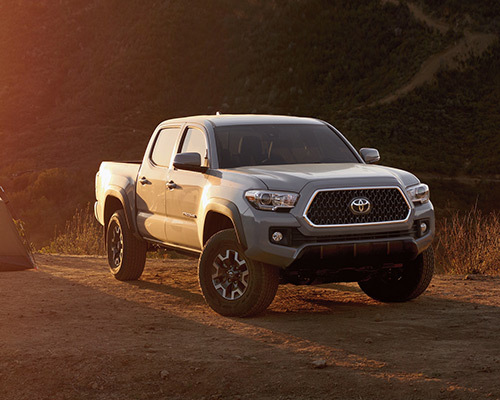 When you buy or lease a Tacoma from Westbury Toyota in Westbury, you can gear up this pickup to effortlessly navigate over any terrains you end up discovering. 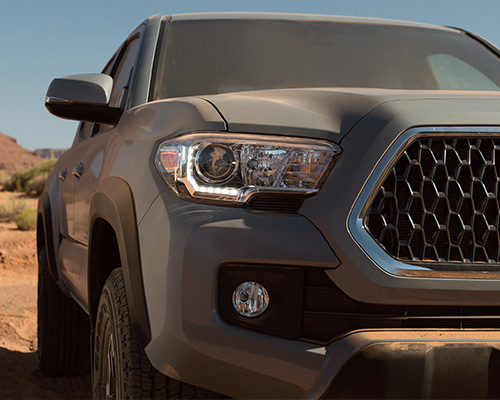 The silky-accentuated cabin of Toyota Tacoma was thoroughly tailored to perform as an individual's command hub based around an easy-to-use control design. A touchscreen monitor (high-definition on many variants) employs Bluetooth wireless technology for hands-free phone calls, connecting with your apps, broadcasting music, and so much more. It additionally comes equipped with a built-in GoPro mount on the windshield, so you can quickly position the video cam and document all of the legendary experiences your team will hope to re-experience often. Toyota made certain you felt shielded within your brand-new truck, specifically while on the trail. Tacoma stands as the lone truck in its category created with an included pre-collision indicator. Toyota Safety Sense P (TSS-P) is comprised of active safety features that boost your street insight, and the rearview screen installed on the tailgate handle assists in making backing up an easier, less hazardous process. Each Tacoma also comprises lighter, high-intensity steel that improves the frame and optimizes effectiveness. The most recent Toyota Tacoma expresses this automaker’s history of sturdiness, allowing you to leave the trail and uncover a different route, regardless of the geography. If you wish to purchase or lease a pickup in Westbury NY that kicks open the door to playing harder with no need for any reservations, then stop by Westbury Toyota to obtain the potent Toyota Tacoma.